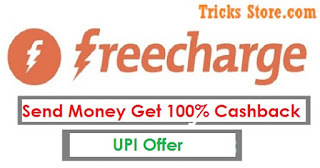 Freecharge recharge offer, Freecharge UPI cashback Offer, Frecharge send money cashback offer, Frecharge Free cashback Offer – Hello Friends, Freechrge new cashback Offer is here hope you are enjoying our all new free recharge coupon code trick and airtel free internet trick. And this time we are back with Freecharge Cashback on Money Transfer . Guys Freecharge is offering 100% cashback upto Rs 25 on Minimum Transaction of Rs 25 or above. 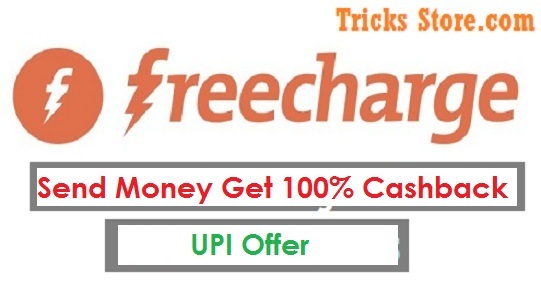 Now send money via Freecharge UPI and win free 100% Cashback. As like others Freecharge also launched it’s UPI Send/Recieve Money feature on freecharge app & now they are Offering Flat 100% Cashback when you transfer/send Money for the 1st time. Offer is vailid for limited period of time till 11th May 2018​. So guys why are you waiting for grab this loot freecharge deal now. 2. After that Install/Open Freecharge app on your device. 3. Now make a Login/Sign up with your account on Freecharge. 5. Than send money to any Other UPI address of amount Rs 25 or more . * No minimum transfer amount required.